This film received an Honorable Mention on the Best of 2003 list. Without the vastness of the big-screen desert turning you into the third character in this film, it might have a hard time holding your attention. But widescreen is a must. Van Sant shot it in 2.35:1 for a reason. 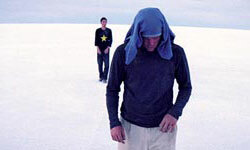 An inexplicably compelling, far-outside-the-box excursion from director Gus Van Sant, "Gerry" is a modestly sweeping experimental movie -- one of very long takes and very little dialogue -- about little more than two buddies getting lost in the desert. Having wandered off the trail on their way to some informal rest-stop attraction, at first the two road-trippers (Van Sant's co-writers Casey Affleck and Matt Damon) aren't too worried about their predicament. Flushed with the assumed immortality of youth, they're certain the freeway is just over this hill or that -- or at least they'll be able to see it from the next crest. They walk with purpose and almost enjoy the adventure, even making light when Affleck scrambles up a rock outcropping to scout the area and can't find his way back down. As Damon rakes the ground with his foot to build a feeble "dirt mattress" to break his friend's fall, they snicker and bicker and troubleshoot the situation, debating the odds of a broken ankle if he jumps. But over several days of wandering through increasingly barren terrains that look less and less like the scrub brush where they parked the car, the pals (who call each other Gerry, a word that serves as a noun, adjective and verb in their personal vernacular) gradually become dispirited, dehydrated ghosts of their former selves, slowly, weakly, silently shuffling across barren, never-ending expanses of hard white sand. In a cunning stroke of transfixing simplicity, Van Sant, who became friends with his stars when they were making "Good Will Hunting" (written by Damon and Casey's more famous brother Ben), captures the isolation and desolation -- and the paradoxical beauty -- of this fateful journey by treating the camera almost as an invisible, unblinking third party. Single shots last several curiously engrossing minutes at a stretch, sometimes depicting modestly funny escapades (the rock incident), sometimes depicting offhand conversation (to break up the tedium, Affleck tells Damon the story of his victory in a long-format video game), and sometimes quietly capturing the unspoken fear and frustration as the men trudge blindly along, not even knowing why they're doing it anymore. The movie's longest, most silent and most uneventful scene is also its most beautiful and fascinating. It's a shot that begins in the near blackness of pre-dawn, following the crestfallen men from several yards behind as they stagger, only out of habit, through a seemingly vast empty lake bed into the rising sun. "Gerry" is not a movie about dramatic subjects like survival (no mention is made of hunger) or self-discovery. Nor is it about ostentatious acting challenges (stylistically it is the polar opposite of Tom Hanks' showboating loneliness in "Cast Away"). But it is a meditative, metaphorical, metaphysical, largely internalized exploration of friendship and personal tribulation. And it's a welcome return of Van Sant to his roots as one of American cinema's more daring filmmakers.